Your Twin XL Bedding is what starts out your dorm room decor theme. Typically, when you think of your dorm bedding adding to your dorm room decorations, you think of your Twin XL Comforter. However, your dorm pillowcases are just as important to your Twin XL Dorm Bedding and Dorm Room Decor. Your college pillows don't have to stay hidden under your Extra Long Twin Comforter. Make them a part of your high impact dorm room decor with our College Pillowcases - Sleeping Fox. 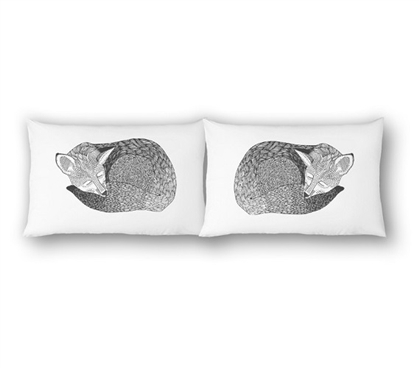 Our College Pillowcases - Sleeping Fox come in a pack of two and feature a gray sketched sleeping fox on a white backdrop. The neutral color and simple design will add to your dorm room decorations for a unique look no matter what color and pattern you have for your dorm room decor theme. Of course, your comfort matters just as much as your dorm room decor and you want your head to lie on a soft surface. Our College Pillowcases - Sleeping Fox are made of 100% Cotton for an incredibly soft feel that will provide you with the comfort you need for a quality night's sleep.